Promotional listings for die-cast and card releases included. Comprehensive and easy-to-use card alphabetical checklist. Checklist for many of the top drivers – perfect for single-driver collectors. Complete checklists and pricing for virtually every racing card set from 1910 to present. 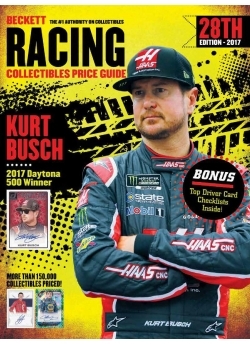 More than 3,000 card sets and 33,000 die-cast replica listings for NASCAR, Indy-style racing, Formula One, World of Outlaws, drag racing, sprint cars, and dirt cars.